Archimedes was a Greek mathematician, physicist, engineer, inventor, and astronomer. His discoveries of physics include an explanation of the principle of the lever. 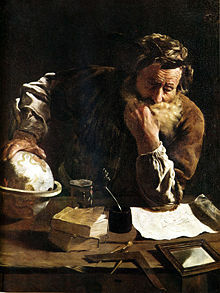 Archimedes is considered as a well established scientist as well as a mathematician. He is credited for designing simple machines, such as a screw pump, that holds his name in the air. Moreover, Archimedes used the method of exhaustion to calculate the area under the arc of a parabola to approximate the value of pi. He also defined the spiral, formulas for the volumes of surfaces, and a system for expressing very large numbers. Archimedes died during the Siege of Syracuse when he was killed by a Roman soldier. The tomb of Archimedes is held in place by a sphere inside a cyclinder. Archimedes had proved that the sphere has two-thirds of the volume and surface area of the cylinder, and made this his greatest mathematical achievements. Unlike his inventions, written work of Archimedes did not survive. However, the Greek scientist has proven to be a role model for many scientists to come.